THE BACK STORY: My brother tried to jump the creek in our backyard when I was growing up, inspiring Nash’s jump. My brother, sisters, and I discovered a tree-house identical to Nash and Chloe’s. Even bits of Chloe’s high school dating stories are similar to mine. My childhood lives in this story. I’ve always loved the idea of a broken relationship getting a second chance, an opportunity for mistakes to be corrected. Regret can eat you up. It is one of the strongest feelings you can experience, other than the hope of being given a chance to make up for those errors. WHY THIS TITLE? : Nash and Chloe grew up together. Cold Springs is where they found each other, and where they lost each other. This is their hometown heartache. WHY SOMEONE WOULD WANT TO READ IT: Chloe is an unusual heroine. She’s hardened, and isn’t someone to admire in the beginning. As you read on, you understand her motivations, have sympathy for her, and begin to root for her to find her happily ever after. Nash, too, acts kind of like a jerk at first, but you know it is because he loves Chloe so much. After he acts rashly, he regrets losing control of his emotions and sets about repairing their relationship. AUTHOR PROFILE: M.J. Schiller is a lunch lady/romance-romantic suspense writer. She enjoys writing novels whose characters include rock stars, desert princes, teachers, futuristic Knights, construction workers, cops, and a wide variety of others. In her mind everybody has a romance. She is the mother of a twenty-year-old and three eighteen-year-olds. That’s right, triplets! So having recently taught four children to drive, she likes to escape from life on occasion by pretending to be a rock star at karaoke. However…you won’t be seeing her name on any record labels soon. Thanks so much for having me! I like the way you put the post together! I love stories that deal with making up for past regrets, and I’m sure I’ll love this one! Chloe and Nash sound like real people I’d want to know – even if they don’t seem all that likeable at first. And how awesome that you were able to incorporate so much of your childhood experiences in the book! Yeah. I knew those stories would come in handy some day! 😉 Thank you for your kind comments, Patricia! And for stopping by! Interesting post! I love how your actual childhood influenced the story. And I love that your main characters are flawed. This is in my TBR pile, and I must get to it soon! I’m flattered, Alicia, as I love your work! Thanks for taking the time to visit! Great interview! Your explanation of the title makes so much sense. I like titles that actually tell you something about the story and aren’t just to grab attention. Best of luck. Thanks, Marissa! Titles can be tricky. I appreciate you taking the time to join us today! I love hometown romances, especially since my hubs and I graduated in the same h.s. class. 7 couples in that class married each other–all but one marriage survived w/o divorce. Thanks for a nice post! I enjoyed your interview and learning more about you and your characters! 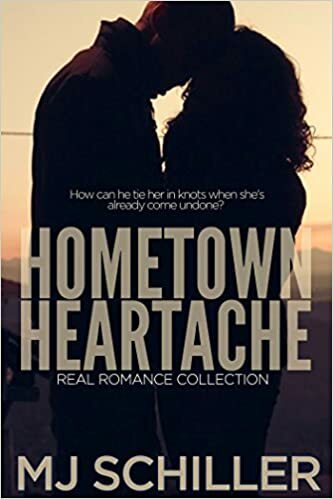 Just completed reading The Heart Teaches Best, and am sure I’ll like Hometown Heartache, too! Best wishes on your book release. Some of my favorite stories are about regaining past love. This one sounds wonderful. Loved the story of where it came from. Good luck to you! Me, too. It is such a compelling thought. Isn’t it a great job we have? Giving everyone their happily ever after? Thank you, Kara, for joining us today! Very interesting post. It’s so great to use things from real life in your writing. Love the premise for this story and the pieces of your childhood you wove into the story. Wishing you much success with it! Thanks, Leah! It’s always fun to be able to use something that really happened to you. Hope you’re having a good day and thanks for joining us! I love hearing how you came you with the title. I’ve always loved it – Hometown Heartache…sigh! It’s in my TBR pile! Reunion stories are some of my favs! I hope when you read it you like it, Darcy! It’s always nerve-wracking when a talented author such as yourself is reading your work! Thanks for popping in today!